Ask fellow campers about "Natchez Trace Parkway -- Rocky Springs (NPS Campground)" and nearby attractions. 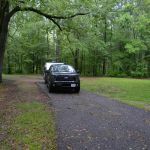 When we arrived at this free NPS campground, just off of the Natchez Trace, around noon there were no other campers so we had our pick of "sites." It was impossible to tell discrete sites. The campground layout, if there was a layout, looked like it had been done with crayons on a napkin after drinking too much. There was really no rhyme or reason. We finally chose a fairly level area that looked like it might be a site and was out of the road. The setting itself was actually very pretty and certainly calm. No one except us would like notice, but there was the sound of some sort of distant factory. Later on that evening, there were two additional campers that arrived. There are actually not very many sites that would be level and suitable for a big rig. As distinguished from the other two campgrounds on the Trace, there was no faucet for filling a holding tank. There was no dump, but the toilet does have flush toilets. The only park personnel we saw was a maintenance man emptying trash cans. We had planned on staying at this campground for two or three nights, but left after one night as we did not feel comfortable leaving our rig there to explore the area without any other campers there. It is heavily tree covered, but we were able to get satellite for DirecTV using our portable dish and a lot of patience. We did have weak, but usable Verizon voice and data using our booster. Given the reasonable cost (free), we would certainly stay here a night if passing through. We camped at Natchez Trace Parkway -- Rocky Springs (NPS Campground) in a Motorhome. Drive the Natchez Trace - beautiful. There is a mix of pull through and back in sites, most are not level, but all have a paved pads and are relatively well spaced with picnic table and fire rings. The road looping through the campground was in rough shape, with a lot of potholes, but otherwise easy to navigate and unobstructed. Bathrooms (there are no showers) were clean and well stocked. Bear boxes for trash are scattered throughout. On site amphitheater looked as if it had not been used in a long time and was literally falling apart. I saw no staff or rangers, and there were very few other campers on the rainy weeknight I was there. We camped at Natchez Trace Parkway -- Rocky Springs (NPS Campground) in a Travel Trailer. The Rocky Springs campground, operated by the National Park Service, is on the Natchez Trace Parkway about halfway between Natchez & Jackson. The maintenance of the campground does not match the excellent maintenance of the Parkway itself. The campground is free, first come first served only, no reservations The internal campground road & pads at sites are badly deteriorated asphalt. There are two restroom buildings with one permanently closed. There is no attendant nor a campground host. There is no water except at the restroom sink, no dump, no electric. There are flush toilets. Neither AT&T nor Verizon cellphone service was available. At the end of April, on a weekend, the campground was no more than a third full, so it was very private. The campground is heavily wooded. There are both back-in and pull-through sites. Some pull-throughs could accommodate two big rigs plus two toads. 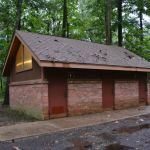 Two pull-throughs were closed due to construction Bad weather brought down many tree limbs and trees in the general area, but the campground saw little more than some wind and rain. A Park Service ranger came by briefly on the Sunday afternoon to check that campers were ok. There were branches and trees down on the Parkway road immediately after the storm. By the next day they were all cleaned up and the road surface was swept clean. We camped at Natchez Trace Parkway -- Rocky Springs (NPS Campground) in a Travel Trailer. Rocky Springs is a smaller NPS park directly on the Natchez Trace Parkway. We camped in the unused Host Site, but there were about 5 or 6 sites that could have accommodated our 39' RV. Many other sites for smaller campers or motor homes. The initial entry sites are the most level. If you see one you like in the first 10 or so, grab it. The rest are up on the hill, not as level. There was lots of room to maneuver our RV through the campground. The restrooms were clean, as were the sites, even though no host was present. No AT&T or Verizon coverage. Most sites are wooded and only a few had a satellite view. Best of all, its free. What's not to like! We would definitely stay here again. We camped at Natchez Trace Parkway -- Rocky Springs (NPS Campground) in a Motorhome. This is a nice FREE National Park campground right along the Natchez Trace Parkway. No hookups, no water fill or dump station available so arrive prepared. Sites were mostly wooded and paved although many were in need of repair. Picnic tables and fire rings at each site. Great place to spend a night or 2 along the Trace. Very few sites were occupied when we visited in early May. No Verizon cellular voice or data service. We camped at Natchez Trace Parkway -- Rocky Springs (NPS Campground) in a Travel Trailer. Sites not numbered. Free – This campground is in the recreational area of the Rocky Springs Site. No electricity or water but water at the bathrooms. This campground needs some work. Sites need to be leveled and repaved. We had driven down here on the Trace to avoid some violent storms that were going through Jackson for two days and it was a good stop. There were four other campers in the park for the first night and only us for the second. Another camper had told us three weeks earlier the snowbirds heading home on the Trace squeezed 43 RV’s in 19 sites. 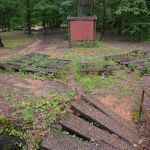 The Rocky Springs Site and trail in the park is fascinating with the old church, dried out springs and markers for the whole town in the woods. This park is also near Port Gibson which was not burned by Grant because it was too beautiful on his march through MS. The Windsor ruins are worth the drive to go see. If we traveled the Trace again we would stay here for a one night stay. It was very peaceful! Just a note about three hours after we left this campground a tornado was seen heading for it right up the Trace. We camped at Natchez Trace Parkway -- Rocky Springs (NPS Campground) in a Motorhome. Very nice CG and free. But beware, we came in during the annual French Canadian migration north out of their winter spots. We only got a site because someone saw our FL tags and did not want another French Canadian next to him, we pulled in as the other MH pulled out. 22 sites, but there were 36 RV's one night, most sites 2 deep, some with 3. Handicapped site taken and cones moved from empty host site so they could take it. Car parking area held 2 more, some smaller units on the side of road. Totally out of control, will be writing to the NPS about it. A no hookup in Canada cost us $27.50 and they are taking this place over, lots of them stay a couple of weeks at a time. They have some kind of schedule, as some left on morning another pulled right in. We camped at Natchez Trace Parkway -- Rocky Springs (NPS Campground) in a Motorhome. Campground is crazy busy Oct 15 - Nov 20 and Mar 15 - Apr 20 when northern "snowbirds" (both Canadian and American) are on migration. When hosts are onsite (Oct 15 - Mar 25), the 10-14 day limit is enforced, but double/triple parking is allowed. Early arrival is encouraged, especially by tent campers. Late November, through early March can be idyllic, if weather cooperates. Lots of birds, small critters, and hiking/bicycling opportunities. We camped at Natchez Trace Parkway -- Rocky Springs (NPS Campground) in a Fifth Wheel. Loved this site! We arrived on a Wednesday, which is a good thing, because it was full by Friday morning. The sites are very spacious, private, and shaded- and the bathrooms are the cleanest I've ever seen, complete with running water- unexpected, considering the campsite is free! We stayed in a tent, so I don't know if there were hookups of any kind. A lot of our fellow campers had RV's and ran generators overnight, so I assume no? The campground hosts were great, very friendly and helpful. The only thing to remember is this site is secluded, you will not have cell service and the closest amenities are 30 miles away in any direction..we camped in early March, so perhaps it was too early in the season, but we could not find firewood to purchase ANYWHERE. The hosts were great though, they knew our plight and gave us firewood on the cold nights! Make sure to come prepared with enough food, firewood, etc. and you will love this site. (ps-had to enter $1 for the fee because $0 is not allowed..this campsite is FREE!) We camped at Natchez Trace Parkway -- Rocky Springs (NPS Campground) in a Tent. Beautiful, well maintained campground run by National Park Service. All paved and semi-level sites. Bathrooms, but no hook-ups, showers, or amenities -- just nice dry camping. On the Natchez Trace Parkway about 25 miles south of Jackson and 30 miles north of Natchez, MS. Best of all -- it is pristine and FREE! I only entered $1 above because the website won't let you enter zero. We probably would not have brought our 43' motorcoach here (although there were some nice long pull-throughs), just because of the twists and turns, and because we couldn't explore the trace as well in a larger coach; but in our truck camper, it was just perfect. We camped at Natchez Trace Parkway -- Rocky Springs (NPS Campground) in a Truck Camper. Are you affiliated with Natchez Trace Parkway -- Rocky Springs (NPS Campground) ?